QHow do you set up the Searcher2/Searcher Control stack ? Note: There can only be one Searcher2/Searcher Control stack per page. Having more than one will cause confusion for visitors, as results would override each other. Determine where you would like the Control (input box) to be located. It can be placed anywhere in the main body by a simple drag & drop. It can also be placed in a sidebar, Extra Content Area or any other area that allows html code. If you want it in an EC area or other area, first drag it into the main body and then drag and drop the provided snippet named 'Searcher Control Append - HTML' into the desired location. Note: If placing in the Sidebar and the gear in the lower right corner of the Sidebar is set to 'Styled', then highlight the code you just placed and from the RapidWeaver menu select Format > Ignore Formatting. 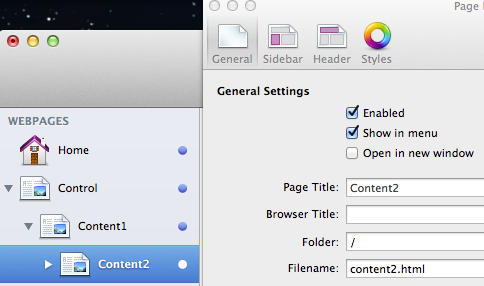 So, the relative path from Control page to Content1 would be "content1/content1.html" Notice that Content1 is actually inside of a folder called content1. Now for Content2 path: It's inside of the content1 folder so the path would be "content1/content2.html" Notice that Content2 had a "/" for folder which means "don't use a folder" If Content2 had a folder then it would have to be placed in the path in front of content2.html. So that's how you determine the paths. Please Note: Previewing the Searcher2 Control page will generate random imported page content, instead of the Control page content. Simply Publish to view the Control page content and use the searcher functionality. 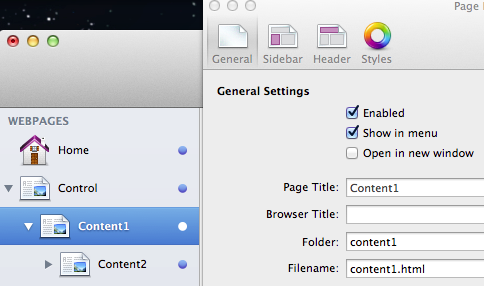 If you wish to view Control page content in Preview, then temporarily deselect the "Site-wide Searching" control. If you need to slightly reposition the control, in an area other than the main body, then drag and drop the provided snippet named 'Searcher Control Container - CSS' into Page Inspector > Header tab > CSS tab > Custom CSS area. The margin values are the default, but you can change the pixel values to whatever you desire, but please leave the !important tags in place. 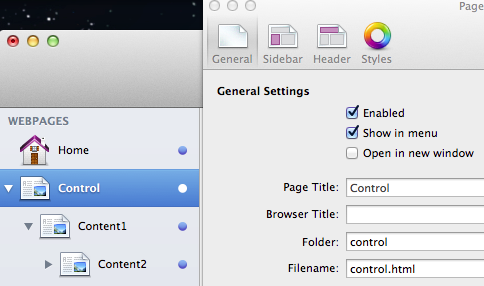 If you need to modify a Control in the main body, then just use the built-in Stacks margin & padding controls.